Why is Tillamook Called Tillamook? Growing up, I thought Tillamook was the only cheese brand. As an adult, I know that Tillamook is cheese, but I still remember how shocked I was when I realized that Tillamook is not just cheese. Driving north on US highway 101, you will pass a sign that says “Tillamook County,” and as pastures dotted with grazing cows zip by your window, you will see the enormous Tillamook County Creamery Association visitor center. Over a million people a year visit the creamery and at least 525,000 ice cream cones fly out the door annually. You can see the production area and follow the conveyor belt as the cheese is wrapped and sent on for ageing and grading. You can also buy various cheeses there, including rare specialty cheeses, as well as butter, ice cream, sour cream and yogurt. So, where did the name Tillamook come from? Well, that is a bit of interesting history. In 1851, the first Caucasian settlers came to a valley located on the northern Oregon coast that was inhabited by three indigenous tribes, one of which was the Tillamook. The valley came to be called the Tillamook Valley. With 5 rivers, 5 bays, the Pacific Ocean and over 90 inches of rain per year, the area was fairly inhospitable until the settlers realized that grass likes to grow there. 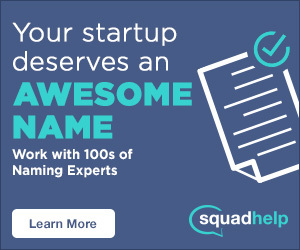 As in, really likes to grow there. In 1894, T.S. Townsend brought dairy implements and cheese making equipment to the Tillamook Valley, along with a guy from Canada who understood cheddaring, Peter McIntosh. That was the birth of the Tillamook Valley cheese industry. Just ten years later, Tillamook County cheddar cheese took first place at the St. Louis World’s Fair in what would become the first of many awards. Why is it Called Tillamook? 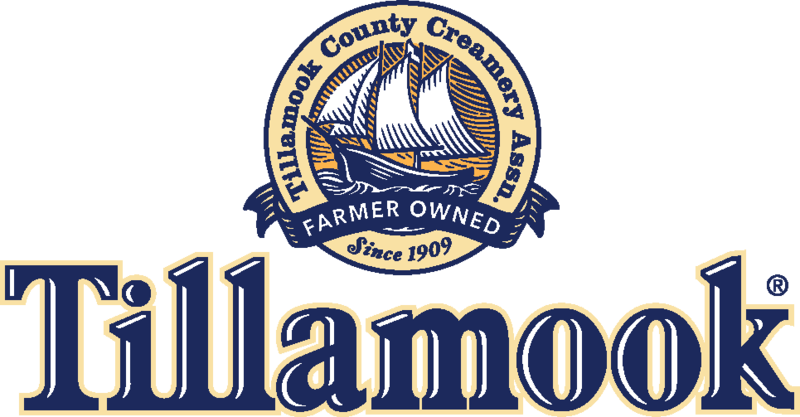 When 10 independent cheese producers merged in 1909, the Tillamook County Creamery Association (TCCA) was formed. Their goal was to establish consistent quality cheeses with the mandate that the cheeses would be marketed from the county itself and not from the individual producers. The TCCA devised strict sanitation rules for the farmers and the cheesemakers, along with a standardized recipe. 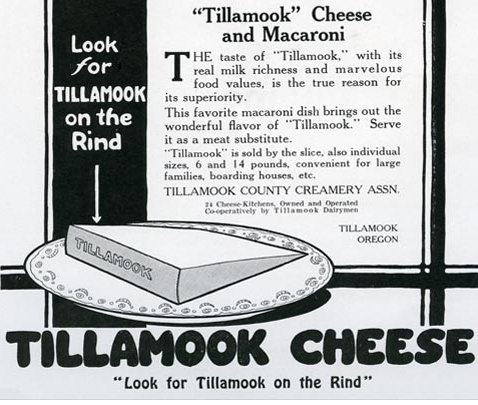 By 1921, they developed their trademark and their first slogan, “Look for Tillamook on the Rind”. 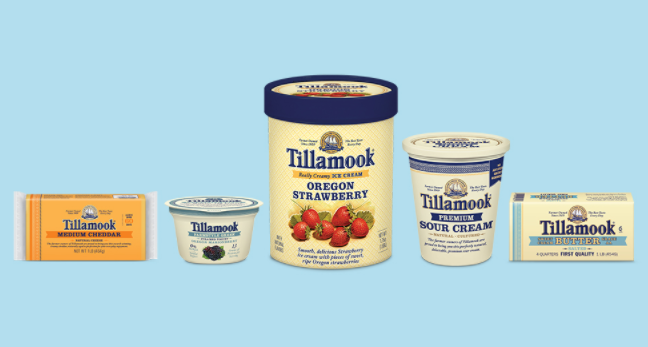 Tillamook went through a brand redesign in 1966 and began incorporating the antique schooner we are used to seeing. Ever wonder what a ship with billowing sails has to do with Tillamook, let alone with cheese? The schooner, christened Morning Star, was used to transport cheese to Portland, Oregon in the mid-1850s. The mountain passes were too dangerous in the rainy season and merchants refused to navigate the treacherous bays, so the farmers came together to build Morning Star. Legend has it that the iron and rope were upcycled from ships stuck in the bays. The sails had been harvested by the local tribes from the broken ships littering the bay and were bartered for while the timbers were locally harvested. Low on provisions and unable to get their cheese to market, Morning Star was their saving hope. Were it not for Morning Star, Tillamook would not exist today.